There was a large pop as the flame shot out in front of my eyes. I watched with a slight hesitation as she grabbed the metal rod and started demonstrating what we were about to do. Her hands looked awfully close to the flame and she was not wearing protective gloves. 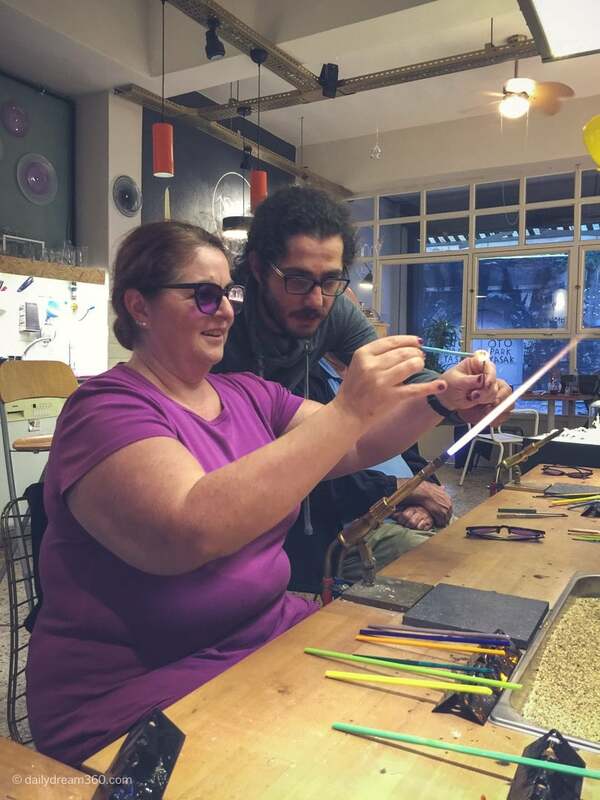 These were my first anxious moments at 1200 Decrees Istanbul Café and Glass Workshop. The old buildings tower above you as you walk the hilly streets in Balat Neighbourhood. Some in very poor condition, with chunks of brick and concrete fallen away. Then you turn a corner and find yourself under some colourful umbrellas and surrounded by artsy cafes and restaurants. Once the Jewish and Greek quarters the neighbourhood aged as gypsies moved into it and now as it happens in many big cities, the ageing buildings are taking new life as young artisans are moving in, painting its walls and stairwells and breathing new life and ideas In their many small businesses. 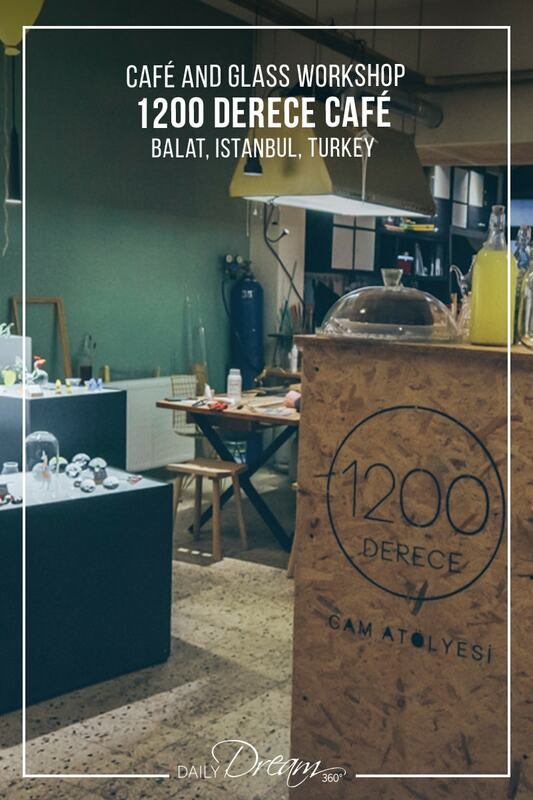 This makes it the perfect neighbourhood for young couple Semih and Merve to merge their passions of coffee and glass blowing in their small café and glassworks studio 1200 Degrees (Derece in Turkish). 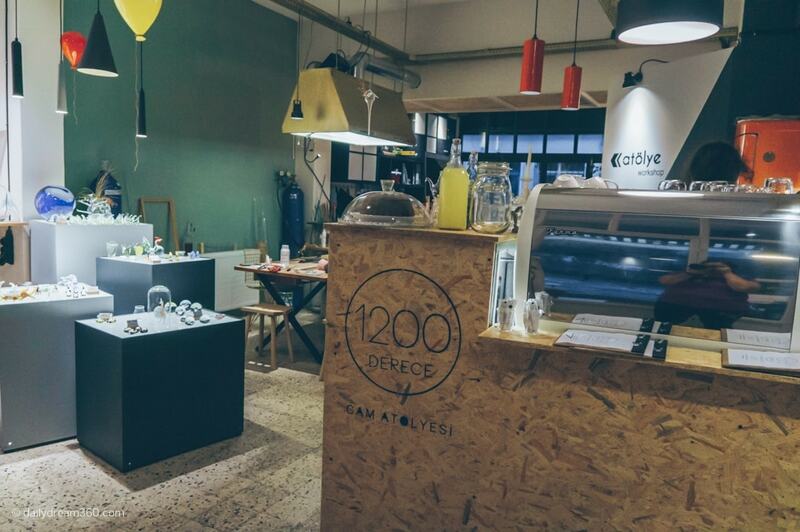 You don’t have to participate in a workshop when visiting this cafe. Grab a Turkish coffee or black tea and a seat at one of the small tables in the studio. 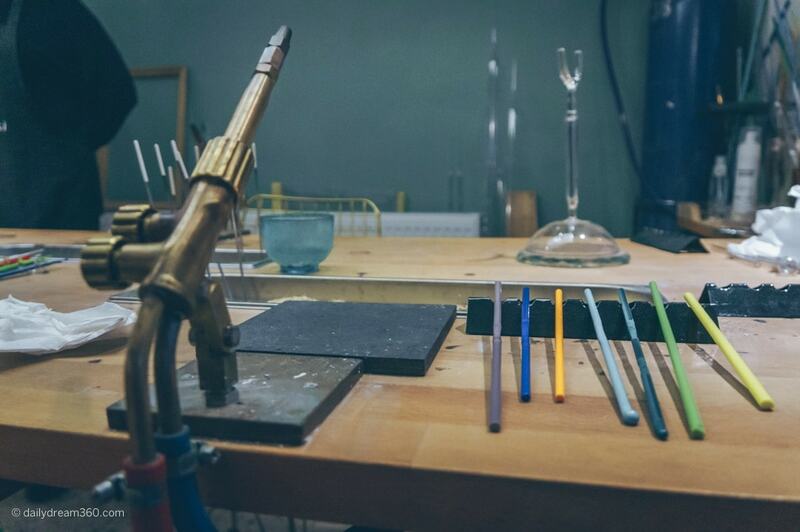 There you can admire the many delicate glass pieces created at the studio by Merve and her team of artists and trainers. 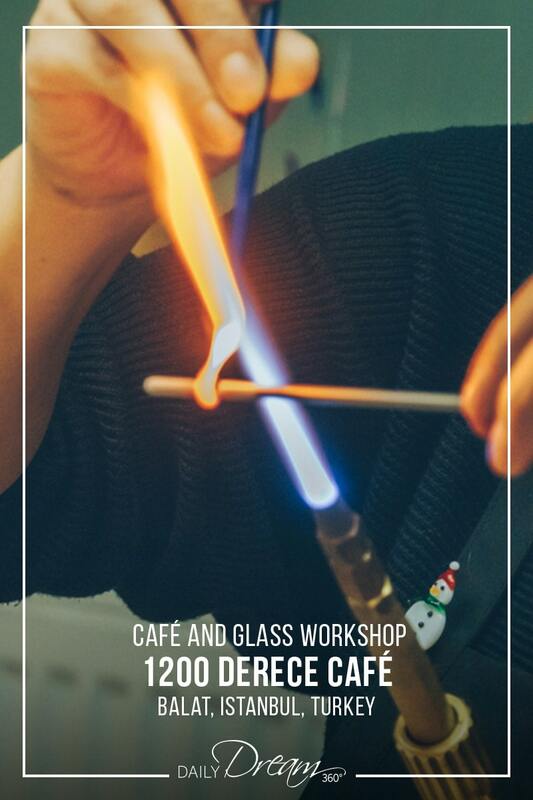 If you are looking for a new experience and want to make your own souvenirs then you can try a glass making workshop held inside the cafe. 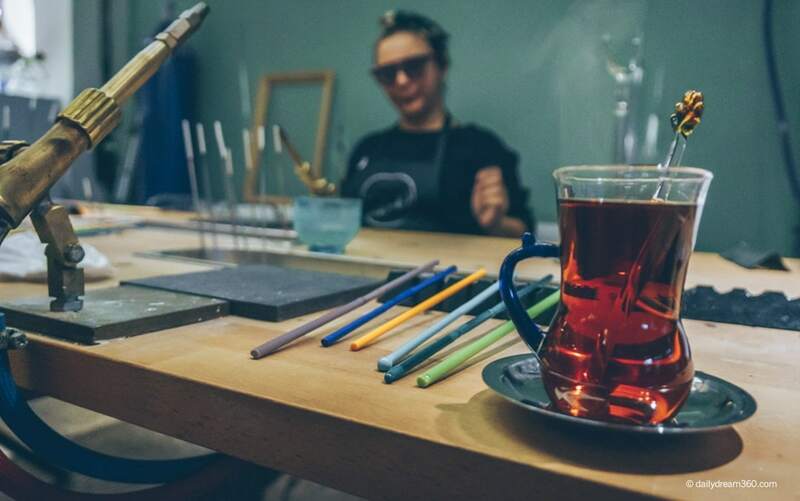 Their website is in Turkish, but you can contact them and plan to join one of their workshops as part of your trip to the city. There are many tour operators who also include this workshop on their tours. 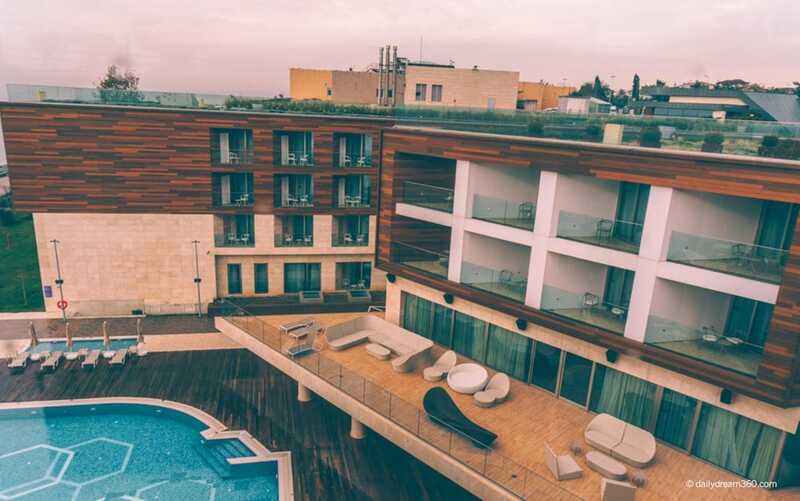 The team at TTG Travel planned this as part of a one day Istanbul city tour. Back to the huge fire streak burning in front of me. Merve demonstrated as we watched anxiously at what we were about to do ourselves. 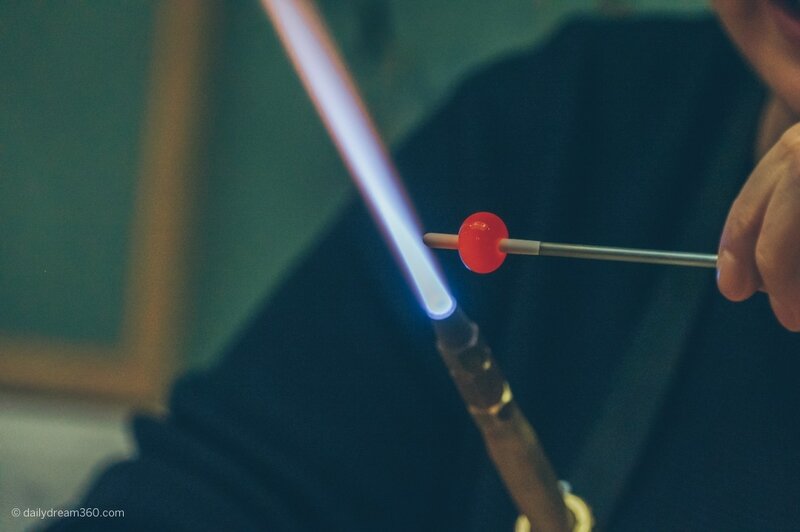 She started with a metal rod which we warmed at the top of the flame, the coolest point of the flame. Gently she moved the wire down towards the middle of the flame and lowered it slightly as she moved a glass rod with her other hand from the top of the flame to the middle where it began to heat up and melt. 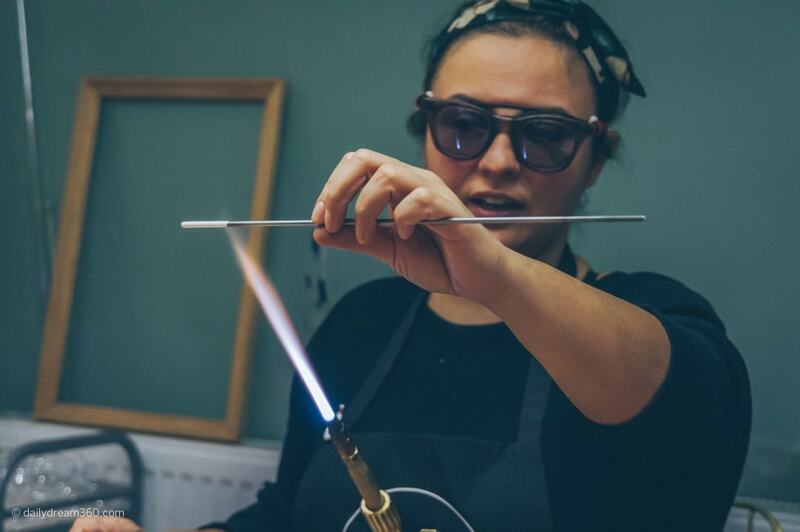 She effortlessly gathered the molten glass on the metal rod as she twisted her fingers holding the metal rod forward in one direction and then twisted the glass rod in her other hand in another direction. With one hand she kept twisting effortlessly and before we knew it she had completed one bead. She turned off her flame and looked at us. It was our turn. 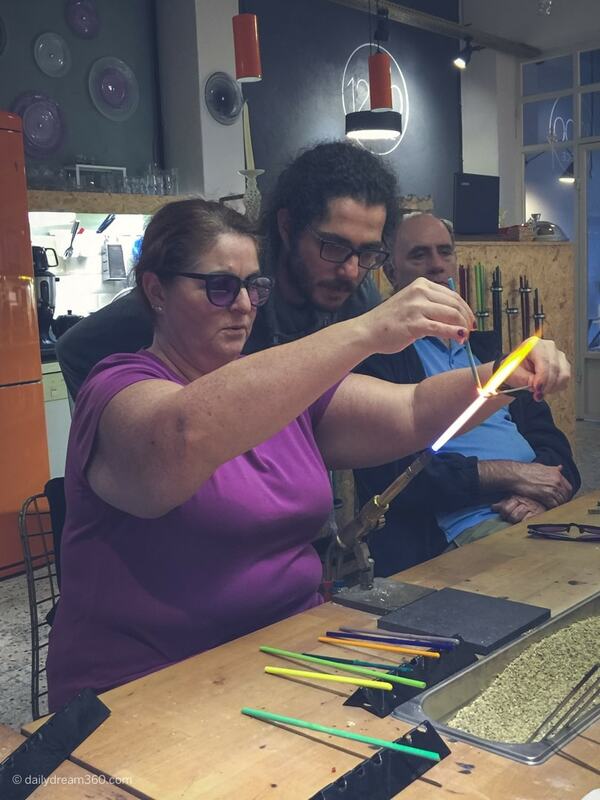 I’ve done glass blowing workshops before but this was hands-on and close to the flame. After watching the first group of participants it was my turn to make some beads. I put on the safety glasses and sat behind the flame thrower and jumped again with that loud pop of the flame. I grabbed my metal rod in my left hand and started to warm it up. 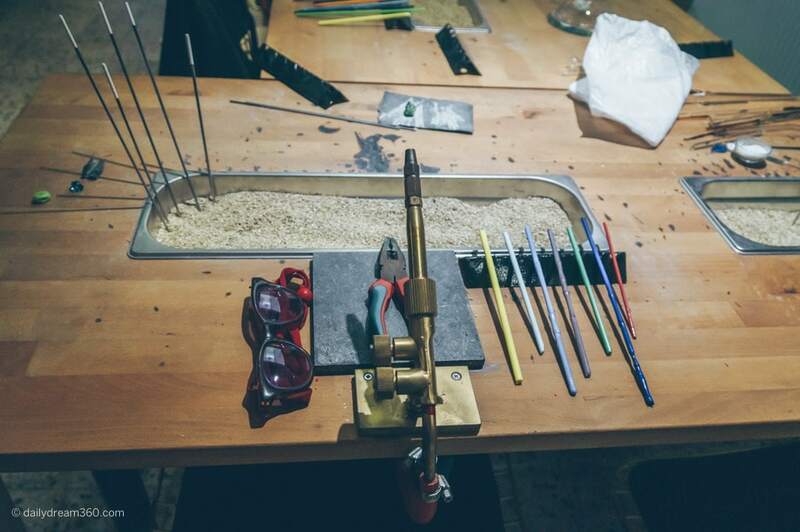 Then with my right, I started working with the glass. With the help of Semih who jumped out from behind the coffee counter to help, I adapted quickly the fear of being burned by the flame disappeared altogether. Before I knew it I had three glass beads resting in the sand to cool off. The next demonstration showed us how to add decoration to our beads. Then we sat behind our flame throwers again. 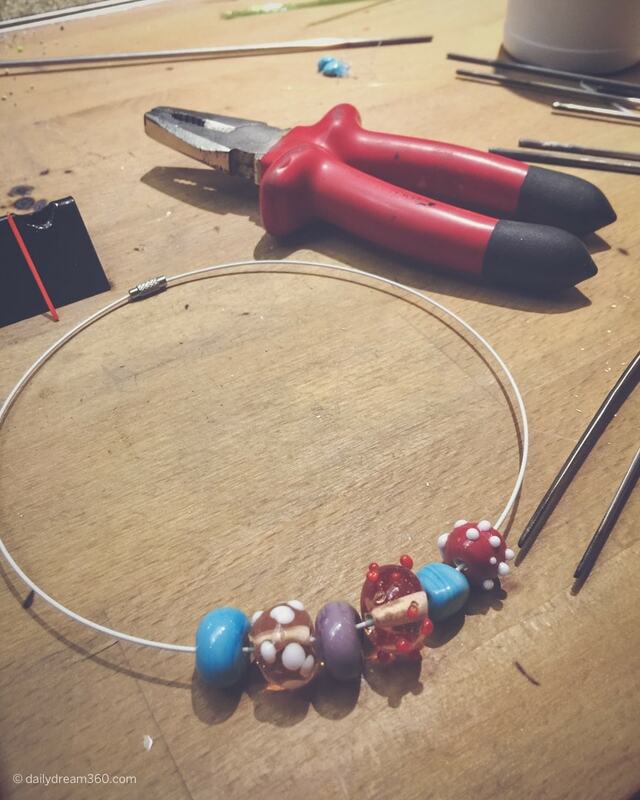 We gathered glass into a bead shape and then with a thinner glass rod we started to apply little decorations. This round of beads being made much more quickly than the first. When it was all over I had 6 beads which Merve put on a necklace for me. 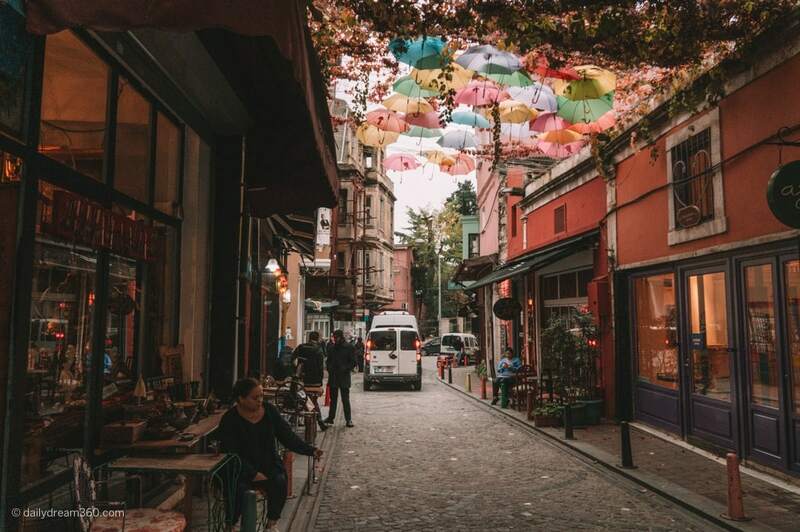 Now I have a lovely souvenir from Istanbul and every time I wear one or more of them I will remember my afternoon at 1200 Derece and my time wandering through this creative Balat neighbourhood in Istanbul.